“I swore If I made it home, I would never follow orders again. Ben Affleck isn’t exactly one of my favorite actors. Not that he’s such a terrible actor, but he’s such a smooth guy who manages to play in some outstanding movies every time. Movies that didn’t leave an everlasting impression on me anyway. In retrospect, it’s really a giant list I’ve seen him in, such as “The Accountant“, “Suicide Squad“, “Batman v Superman“, “Gone Girl“, “Runner Runner“, “Paycheck“, “Changing Lanes“, “Pearl Harbor” and “Daredevil” (absolutely his worst performance). The only memorable role he played was in “Good Will Hunting“. Most probably it’s due to the participation of Matt Damon and Robin Williams. He was also succesfull as a producer and directed the absolute masterpiece “Argo“. With “Live by Night” he tries to be succesfull as leading actor and at the same time as a producer. But that’s a bridge too far in my opinion. The result is pleasing to the eye, but storywise it’s all rather messy and hopelessly complicated. The multiple story lines follow each other in a terrible pace. The main thread is about the prohibition era and illegal trade of alcoholic beverages. Furthermore there are some side plots in which the main role is claimed by a female character. At first Emma Gould (Sienna Miller), mistress of a mafia boss. Then there’s the sister of a Cuban business partner (Zoe Saldana). And finally, the daughter (Ella Fanning) of the sheriff from Tampa who’s being rescued by Joe (Ben Affleck) after she pursuit her luck in Hollywood and ended up as an addicted prostitute. Afterwards she turns out to be a prophet of doom who boycotts Joe’s plan to build a huge casino in Tampa. Just like “Argo“, this is an adaptation of a book by Dennis Lehane. In the past it’s often proved that making a film based on a book isn’t that easy. The big problem is to reproduce the details of a book into a movie. Usually as a result you get a jam packed film crammed with tangled storylines. The solution would be to split it up into multiple movies. 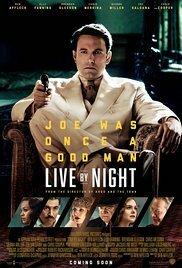 But that’s not really applicable to “Live by night“. The most succesfull part is the way they portrayed this era by using excellent camerawork. A realistic view of America from the 20s, thanks to the magnificent sets, beautiful costumes and authentic props. Ultimately it’s not a truly epic gangster film, but the chase with oldtimers at the beginning of the film and the explosive ending led to some impressive images. In my opinion the biggest problem in this not so bad film, was the acting of Affleck himself. And this has nothing to do with his talent as an actor but rather with his goody-goody appearance. Without a doubt many mothers hope that their daughter would hook up with such a perfect guy. Ideal son in law material, so to speak. But as a gangster he fails completely. Because of his likeable appearance his performance is absolutely implausible. Had they given this part to Michael Shannon for example, the tone of the film would have been harsher and more intimidating. You can safely say this was an ambitious project, but unfortunately it’s a soft version of any leading gangster epic from the past.